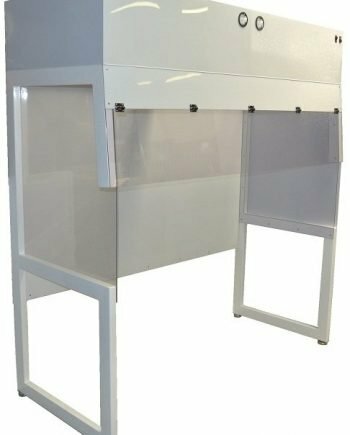 Cleatech Freestanding open base vertical laminar flow clean benches create ultra-clean environment over existing work tables or equipment. Fan system is isolated from the work area making it ideal for vibration-free applications such as a microscope. They incorporate 99.99% efficient HEPA (Also available in 99.999% efficient ULPA) integrated fan / filter modules that remove particulate airborne contamination to meet cleanliness requirements of ISO5 standards. 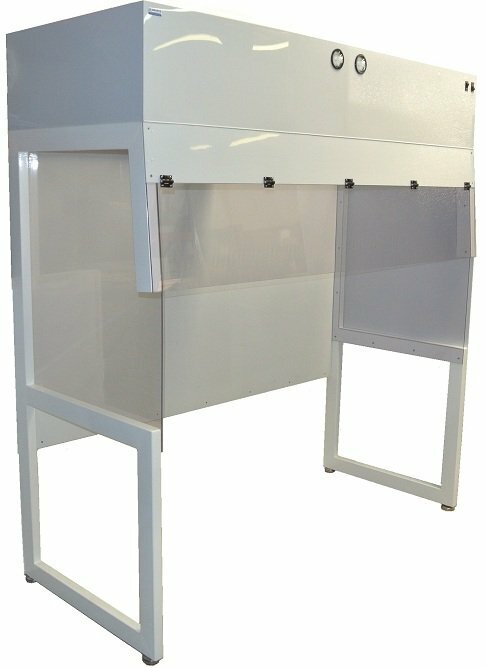 These mini cleanrooms are constructed of epoxy-finished steel frames with option of regular PVC and static-dissipative PVC clear panels available in 4, 5, 6, and 8 feet lengths. 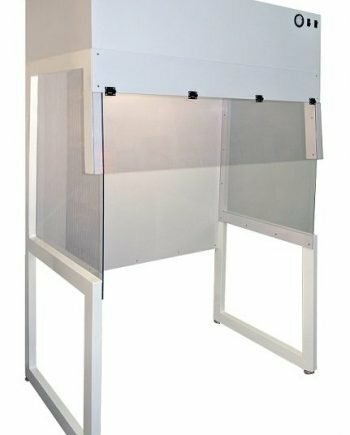 Optional accessories include electrical outlets, ionization, stainless steel frames, casters, ULPA filters, 304 stainless steel worktable with solid or perforated top. Prices above include Fan / Filter Module (120V Fan / HEPA filter 99.99% @ 0.3µm) & Fluorescent Light * 6 & 8 feet models include two Filter and Blower Modules ** The construction of the free-standing hoods are all welded in one piece. The total height without leveling mount is 82 3/8″. Please verify the door clearance of your room before you order. We can customize the height if required with no additional cost. Upto 40% Discount on Worktables – Limited Time Offer!